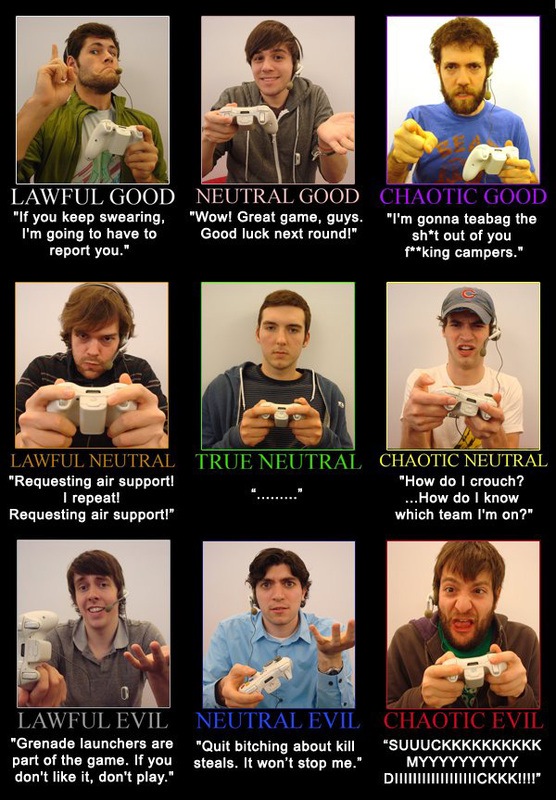 Dueling Analogs: XBL Player Alignment Chart – Girl Gamer, Esq. Sorry for the lack of updates, but I’ve been a bit under the weather. Or the weather has been over me. In the meantime, check out this cross-over between RPG “alignments” and users on XBox Live. Whether intentional or not, it’s interesting to note that none of those pictured are ladies. I would fall under the “true neutral” category, which could realistically be anyone remaining silent, and perhaps there were only a few male friends around on the day of the photoshoot, but I still find it interesting that 9/9 pictured are male. If you find out who disincluded the ladies, I could always find out whether they could have ‘issues’ logging in. It’s a dumb idea to piss off the women who bring you Halo. Which, one believes, proves your point on a meta level.